John Barrowman is an Entertainer with a capital E! He sings, he dances, he acts, presents, judges – he is a unique talent in the industry on both sides of the Atlantic. He currently appears in the regular role of Malcolm Merlyn (The Dark Archer) in the hit American drama series Arrow. He has also appeared as the same character in The Flash, and has done a guest appearance on the CW’s Reign, and ABC’s Scandal. His most famous role is undoubtedly sci-fi hero Captain Jack Harkness on the BBC shows Doctor Who and its wildly successful spinoff, Torchwood. 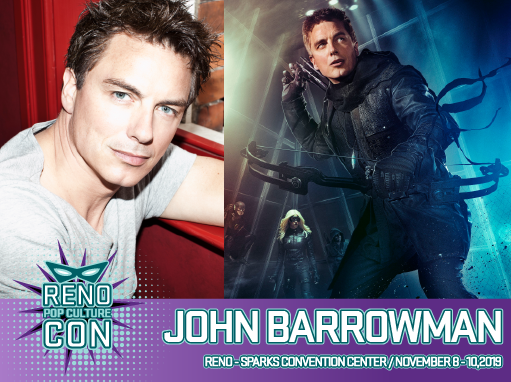 As if this all isn’t impressive enough, John has also authored several books with sister Carole Barrowman in young adult fiction, a Torchwood novel, and Malcolm Merlyn editions of the Arrow comics for DC.